Camping is a Creation that adds a movable campsite for sleeping and cooking in the wilderness. It was released on April 5, 2018 for 300 CC Credits. The Creation's features work well with Survival Mode. "Campsites allow you to rest and stay warm while exploring the wilderness. You can cook a limited number of meals over the campfire. Your campsite is marked on your map so you can locate and fast travel to it later." The reference to staying warm refers to the WarmthCC mechanic added by the Survival Mode Creation. 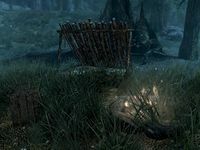 The Camping Creation is intended to be used in conjunction with Survival Mode, due to the new requirements relating to warmth and sleep which are imposed in that mode. With Survival Mode enabled, the campfire will allow you to warm up by staying near it,[verification needed] and will also allow you to craft a limited number of hot soups for later use. This Creation also adds a new loading screen relating to campsites. This page was last modified on 26 January 2019, at 20:53.